I didn’t need a report from a Japanese blogger to convince me that the claims made by Les Kinney, Morningstar Entertainment and the History Channel, first broadcast nationwide by NBC News on July 5, were false and totally without substance. I was the first to publicly denounce Kinney’s assertions for the delusions (at best) that they were, and I’d known about this shameless plot to grab headlines under false pretenses for many months, since a reader from Pennsylvania procured the same photo from the National Archives in College Park, Md., and sent it to me. 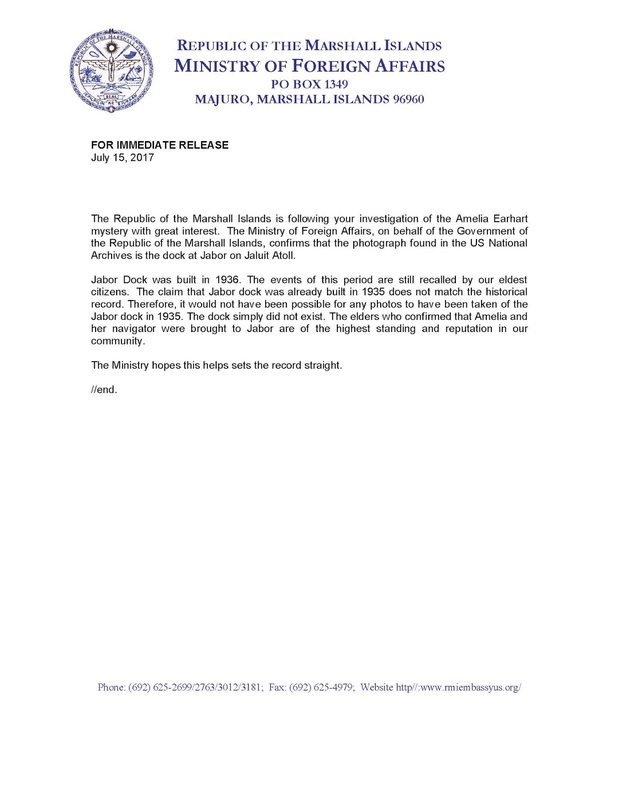 The Republic of the Marshall Islands is following your investigation of the Amelia Earhart mystery with great interest. 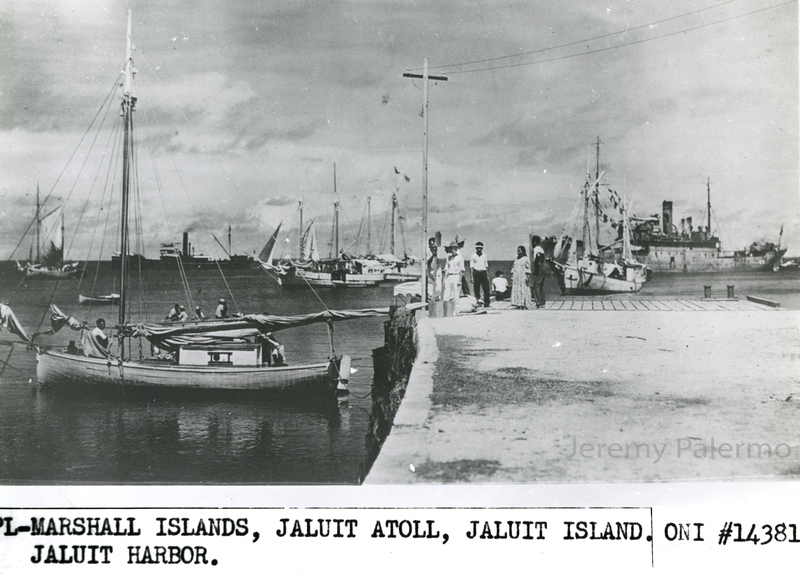 The Ministry of Foreign Affairs, on behalf of the Government of the Republic of the Marshall Islands, confirms that the photograph found in the US National Archives is the dock at Jabor on Jaluit Atoll. Jabor Dock was built in 1936. 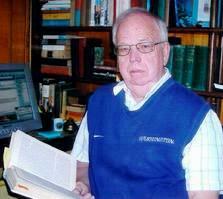 The events of this period are still recalled by our eldest citizens. The claim that Jabor dock was already built in 1935 does not match the historical record. Therefore, it would not have been possible for any photos to have been taken of the Jabor dock in 1935. The dock simply did not exist. The elders who confirmed that Amelia and her navigator were brought to Jabor are of the highest standing and reputation in our community. The ministry hopes this helps the record straight. It’s interesting to note that there is no Internet site for the Republic of the Marshall Islands; the closest I can find to an online presence is a website for the Embassy of the Republic of the Marshall Islands to the United States of America. The obvious question is, who are the “your” referred to in the first line of the press release? Closely following that, we can ask who besides Rich Martini and TIGHAR, who I’ve been told also has posted it, was this release sent to? Surely they weren’t the only recipients of this highly significant statement from the Marshallese government. I think it’s perfectly obvious that the Marshalls statement was sent to many, if not every major player in the American media. How Martini and TIGHAR obtained it is irrelevant. What is relevant is that no one else in our media has paid any attention to it. 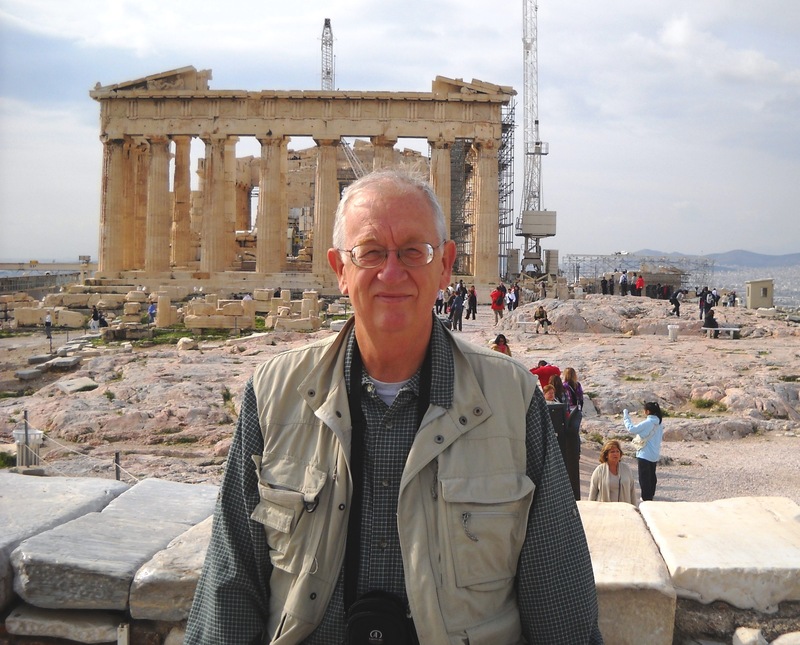 Joel Freedman, of Canandaigua, N.Y., who writes letters and editorials to newspapers locally and nationally in support of the truth, contacted the Marshalls Ministry of Foreign Affairs and was informed that the press release did originate with the Marshallese government. So at least we know this is a legitimate document. So what does this latest revelation, which so directly contradicts The Guardian report about the 1935 origin of the photo, really mean? It must be insignificant, based on the complete silence emanating from our esteemed media, and indeed it does mean little. But the media isn’t interested in it for entirely different reasons. They’ve already played their roles with the phony photo claims in advance of the History Channel’s Earhart special. As far as the establishment media is concerned, the Marshalls-Saipan truth has been discredited, and the public is once again flummoxed and confused about all aspects of the Earhart case. Mission accomplished. 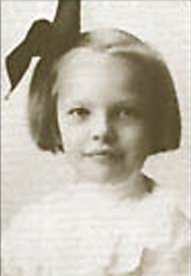 This is the photo that began the current furor, with NBC News breathlessly announcing on July 5 that the Earhart mystery may soon by solved, and which was the cornerstone of the July 9 History Channel special, “Amelia Earhart: The Lost Evidence.” In the program, Les Kinney falsely claimed the photo actually revealed the lost fliers. In the right background is the ship Kinney says is the Japanese survey ship Koshu, with a mass of metal on its stern that could well be a salvaged airplane, possibly the Electra, but impossible to confirm because the definition is lacking. It’s more than likely that the Republic of the Marshall Islands, an independent nation that doesn’t answer to the United States on all matters related to its Earhart propaganda program, was simply not informed by the appropriate parties that the current operation was over. Some in the Marshallese government might actually have been trying to be helpful and set the record straight about the provenance of the photo in relation to the dock at Jaluit. I’m sure their efforts were not appreciated, judging by the overwhelming media silence that has greeted the press release. Meanwhile Martini has now joined the vision-challenged Les Kinney in insisting, despite all evidence, that the photo does indeed reflect the presence of Earhart and Noonan, in effect doubling down on the insanity most thought had been put to rest — and seemingly has been, with the exception of these two luminaries. Martini has apparently decided that he has nothing better to do than to team with Kinney on his grave-digging detail to incoherence and irrelevance in the Earhart chase. But is this really a case of the blind leading the blind, or is it something altogether different, something far more sinister than mere incompetence? On his blog, Martini further muddles the picture by injecting the interesting but complex and unverifiable tale of the “bottle message” found on a beach in France in October 1937 that some have unsuccessfully tried to tie to Earhart by way of French explorer Eric De Bisschop. I decided long ago not to venture into these very murky waters that demand too much speculation to ever be accepted as fact. If you want to be thoroughly confused, I suggest you visit Rich Martini’s blog, where you will come away with far less clarity than you arrived with. The bottom line is that “Earhart Fever,” a condition I’ve seen work its insidious ways on far better than these two, is alive, well and highly contagious. Its victims can be identified by their abject willingness to say or do anything that will bring them a moment’s more attention than they otherwise deserve, which is little or none at all. For those who still fail to understand what has recently transpired despite my best efforts to explain this deviously planned disinformation exercise as clearly as possible, I can only suggest that you carefully re-read the previous posts on the History Channel travesty, and to review Dave Martin’s Seventeen Techniques for Truth Suppression to see how many of them fit nicely into the despicable drama we’ve seen unfold since NBC News kicked it all off with their promotion blitz on July 5. Readers of this blog can continue to trust that this correspondent will always tell them the truth, the whole truth, and nothing but the truth. My integrity and credibility are all I have, and they are infinitely more valuable to me than a few minutes on a third-rate History Channel Earhart special. July 24, 2017: Happy Birthday, Amelia! 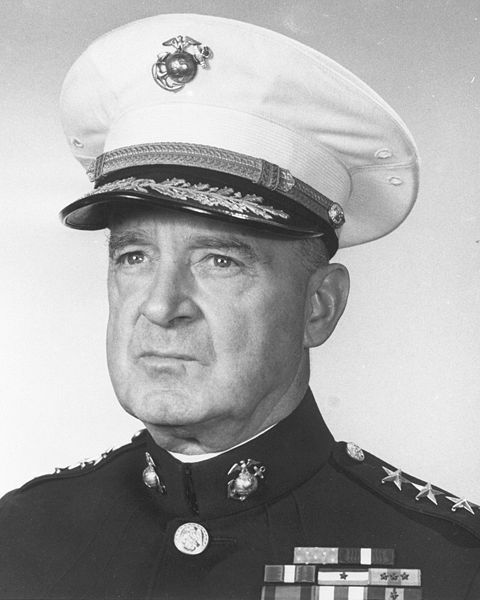 Just wanted to drop you a short note to let you know a few of us are thinking about you on what would be your 120th birthday, had you not run into a spot of bad luck on your round-the-world flight and were still with us at the fairly advanced age of 120. I’m sure the recent events surrounding the phony claims about the photo of the Jaluit dock have amused you, though some of us down here find it a bit harder to laugh at all the absurdity, which of course is the most appropriate response. 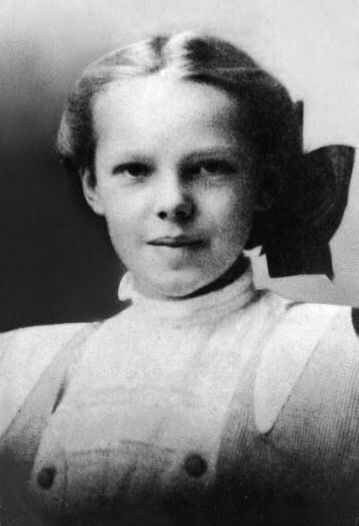 Amelia Earhart in a simpler, happier time, before she found airplanes and G.P. 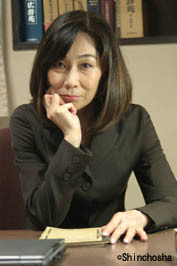 Putnam to complicate her life. You might be spending the day at the house of your birth in Atchison, Kansas, which is now a museum where nearly everyone hates and denies the truth about your tragic demise. Some of the more suggestible among them have even convinced themselves that you’re still out there, flying “north and south” in the ether — alive, well and still lost at 120. Most of the others are happy to believe the lies our government and the ever-present “theorists” have been telling about you and Fred Noonan for 80 years — anything to avoid the unpleasant truth that’s been staring them in the face for so long. Talk about elephants in the room! We know better here, and will continue to honor you by continuing to seek and tell only the truth, exposing the lies and doing our utmost to secure Fred Goerner’s “justice of truth” for you and Fred Noonan. It’s a war I can’t win by myself, but want you to know I’m still here, fighting the good fight, and hope to see you someday in a better place. Until then, Happy Birthday, Amelia! 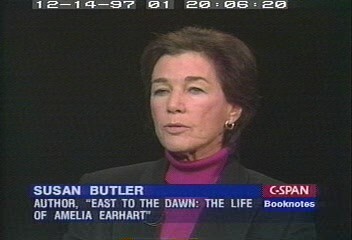 The brilliant news analyst David Martin (www.DCDave.com) has been a friend of mine and of Amelia Earhart: The Truth at Last since the early days after the first edition was published in June 2012, and he continues to be a staunch supporter of the truth in the Earhart disappearance. 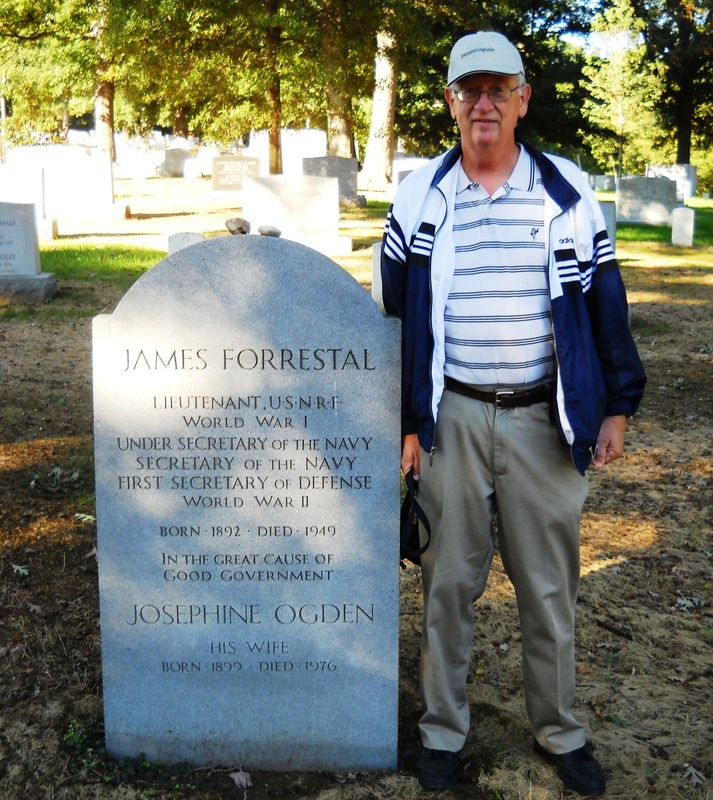 We first met about 2005, when I found his work on the James V. Forrestal case (“Who Killed James Forrestal?”) in an online search and was immediately hooked on the quality and quantity of the truth that Martin discerns and presents on a near-daily basis in his work. Far more than this writer, the better-known Martin has a long history with the Washington establishment and is despised as a persistent pest by the herd journalists in the nation’s capitol, all of whom have made their own little deals with the devil and sold their souls for the coin of the realm, whether it be fame, status, money or influence. Martin is clearly his own man, a beast rarely encountered in this upside-down PC world, and his friendship and support are highly appreciated and never taken for granted here. Without further blather, here’s the start of Martin’s column of today, July 13, “Earhart Photo Story Collapses as Expected, which he later changed to Earhart Photo Story Apparently Debunked. I might have gone further and noted that these two techniques were being wheeled up to the front to supplement the propaganda workhorse #1, which is “Dummy up” and a subcategory of #13, which is creating and publicizing distractions. Up to the airing of this program, our press had virtually blacked out any news of the mountain of evidence that points to Earhart and her navigator, Fred Noonan, having been captured by the Japanese. As author Mike Campbell points out in his review, which we shall get to later, the History Channel did present some quite solid evidence, never before aired by the national news media, that the unfortunate flyers did become prisoners of the Japanese and died at their hands. In effect, they came half clean. But they needed to fill up two hours, and like the “double agent” Christopher Ruddy in the Vince Foster death case, they had to supply a bit more than one questionable photograph to buy credibility with their viewers. What we have here is almost a textbook example of a planted false story. 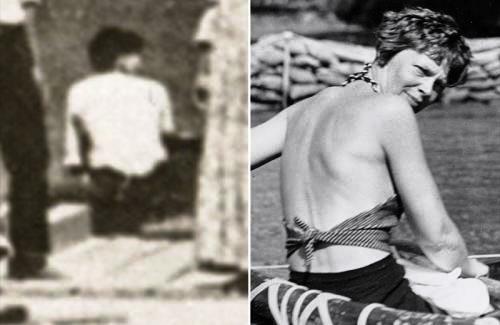 A photograph had been “discovered” in the U.S. National Archives, apparently misfiled, standing alone without any context, which one might interpret as showing Noonan and Earhart lolling around on a dock in Jaluit Harbor in the Marshall Islands. Within a couple of days, though, a mainstream left-wing publication in Britain, The Guardian, reported that a Japanese history enthusiast had discovered the identical photograph in an old Japanese travel book. One must wonder how such a travel-book photo came to be there all by its lonesome in the National Archives. 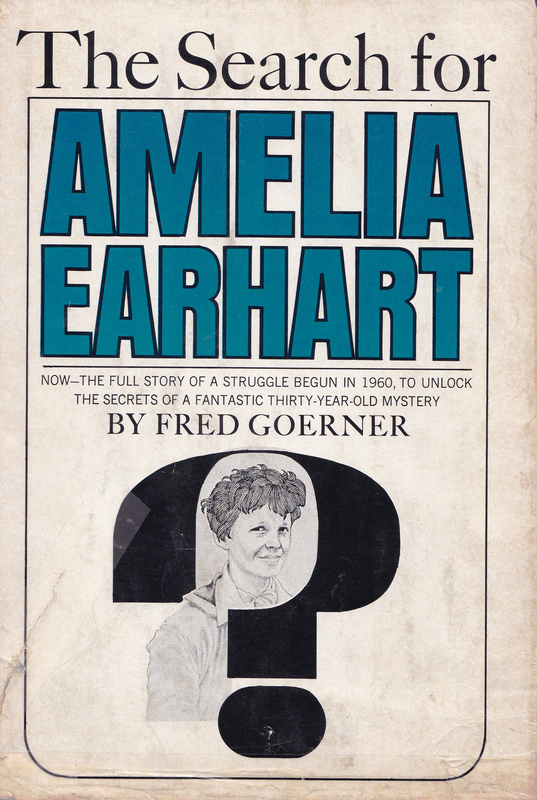 The book was published in Palau, considerably to the west of the Marshall Islands, in 1935, two years before Earhart’s disappearance. For more of David Martin’s fine analysis of the current Earhart flap, please click here.